expansion. 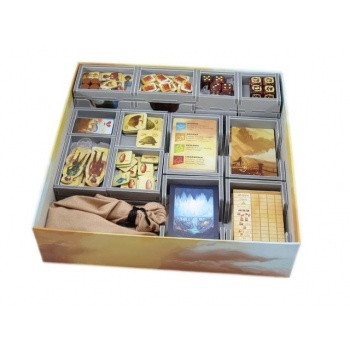 The design provides both efficient storage and improved game play. Many of the trays can be utilised during the game, and they greatly aid set-up and clear-away times. The rules, books, and boards act as a lid on top of the trays. There are trays for the player pieces, the character standees and sheets. There are two trays for coins, meaning they can be spread around the table making access easier. The coin trays are sufficiently large for the metal coins should you have them. Each player has their own tray for their colour. 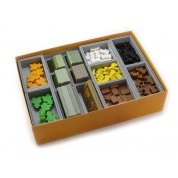 These are the four resource trays, with separate slots for each kind of token and the dice and stands. These are the trays for the small cards. There is space again for all cards to be sleeved with quality sleeves. 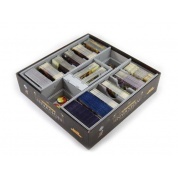 The trays allow for the Amber Mines® expansion small cards. The game boards, rules and storybook fit in a recess on top of the lower trays. The rulebook goes first, which provides space for the ring binder on the storybook to go next. 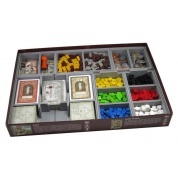 The storybook is followed by the game board and player boards, and then by the Amber Mines® rulebook and the board overlays. Last goes the game atlas, which fills the top of the box, acting as a lid on all the trays below. There is a gap next to the rules underneath that allows the ring binder to not impact on the box lid when closed. 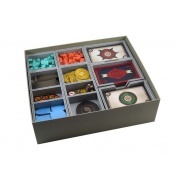 The game can be stored vertically, and transported safely provided the lid is kept in place.